T likes weeds. Most kids do, and to be honest, I like them too! I’ve never understood the desire for a plain old boring green lawn, I say bring on the pretty bits! Puff agrees with me wholeheartedly, and is a huge fan of all the little weeds flowers that grow abundantly in and around our yard. Clover flowers are high up on T’s list of favorites, and in our yard there is an ample supply of these little white and pink darlings. A nice patch on the grass just beside our parking spot ensures that Puff picks miniature bouquets to bring to the people we’re visiting. Nonna, Aunt Ki, even her doctor and my midwife have been gifted with these at least once this spring. I don’t know if they all appreciate T’s sweet gesture as much as I do . . . Sometimes T forgets about them before we arrive at our destination. I have a plethora of dried clover flowers in the back of my car as proof positive of this. . . they make me smile when I see them, I know the days of sweet bits like this one are numbered. 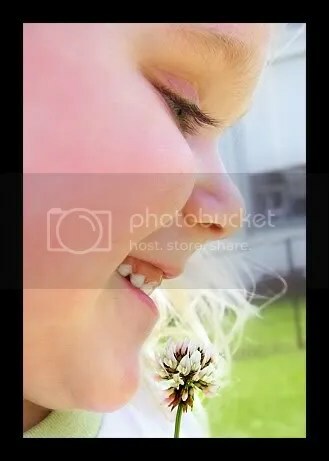 Dandelions, to a child, are some of the most beautiful flowers there are. They’re just so vibrant and cheerful, and then they turn into old man dandies, and we get to make wishes and blow the fluffy bits all over the yard to make new dandies (much to her daddy’s dismay)! Of course, of the things Puffy likes SO much about them is that she’s allowed to pick them, and pick them she does. I’ve already lost count of how many dandelion bouquets I’ve received this spring, and I’ve loved each and every one! But we all know that they really are weeds, as pretty as they are, I wanted T to be able to experience gardening without an actual garden – and the good ol’ dandies weren’t gonna cut it. 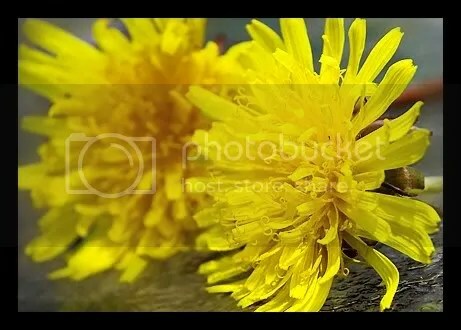 When we were at a shop one day, T’s eyes fell on a pot of marigolds. She loved them, and wanted them. I thought it was a brilliant idea, so she picked the perfect bunch, and we brought them home with us. 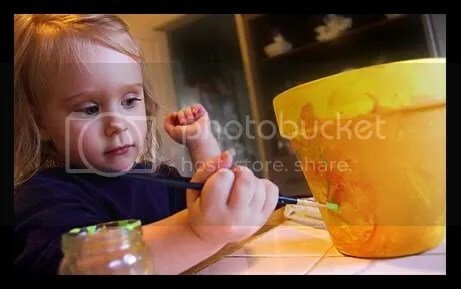 First, she had to paint a pot – of course. . .
She did a great job planting her new friends – and had a great time, too. Now they live on our dining room table, and T has been great about watering and watching. All of the original blooms are gone, but the plant has about 10 buds that we’re hoping blossom pretty soon. 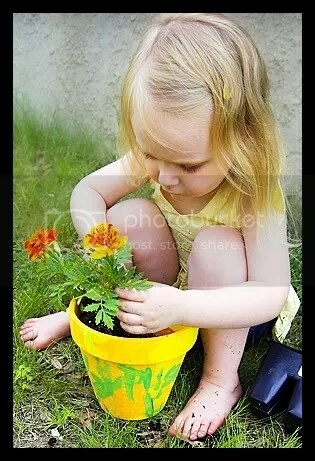 Marigolds are great starter flowers for kids! 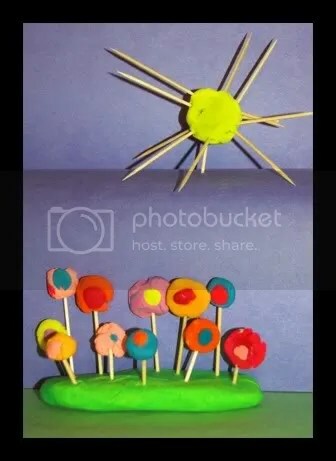 T loves playdoh, so I shouldn’t have been surprised when she started making “lollipop flowers” with it. We usually keep toothpicks in the dough bin to aid in keeping things together when we play (like to attach the heads onto the critters she demands I make for her). It wasn’t too long before she created an entire smooshy garden-full. Daddy let her dry this particular creation out, and a few days later, she added a sun! Puff’s little bit of sunshine has long since been destroyed, and the construction paper background is gone for good, but the garden remains as bright and vibrant as the day of its creation, and has found its way into a position of honor in the ‘backyard’ of the dollhouse she got for her birthday. The dolls that live there are taking great care of their garden. . . If you look on the bottom right corner, you’ll see that T signed her handiwork – three cheers for T! I think, for now. . . that’s all I have to say about flowers! Awesome post! 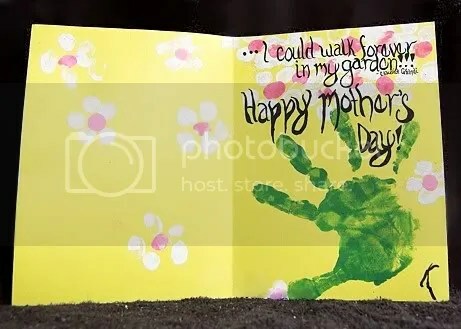 The card looks great and your penmanship is soooo much better than mine would be. Never had a dog eat my homework, unless you count my kids or the computer. Very frustrating! I love her playdough garden, too. That’s awesome!! I should totally plant some marigolds with my girls…I have pots galore that are just begging for some flowers. T is so cute. I know I loved my bunch of flowers from her. And those cards are stinking adorable! You’re amazing. T is amazing too and I think she gets it from you. What a great idea about marigolds! And I bet you could open a cottage industry selling T’s pots. Would love to hear about your butterfly garden. What kinds of plants? What kinds of butterflies? 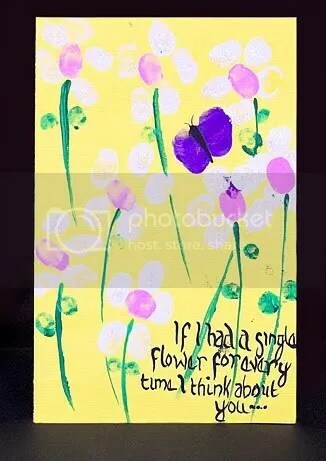 That was quite the flowery post–ha, ha! Once again you have given my incredible ideas to celebrate flowers and weeds!! T is so beautiful! I just LOVE that yellow top. You know it’s my favorite and I’m glad to see T wearing it! MISS YOU GUYS SO MUCH, glad I can see your pics. oh what an adorable project. 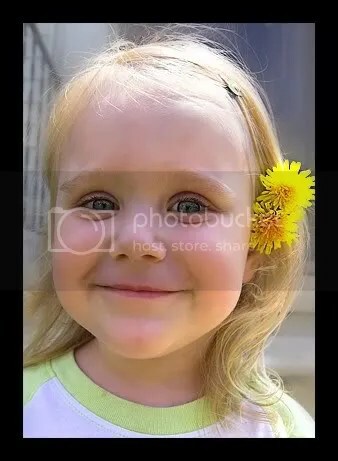 love those playdoh flowers!!! and i agree, i like wildflower weeds. they seem to be the only flowers i can keep alive. LOVE, LOVE the card! Cute idea! We love painting flower pots! Rachel painted and planted for her three preschool teachers end of the year gifts! A gift that keeps on giving! that is wonderful! those pictures are wonderful and she looks like such a little lady. you can almost see her in her teens. 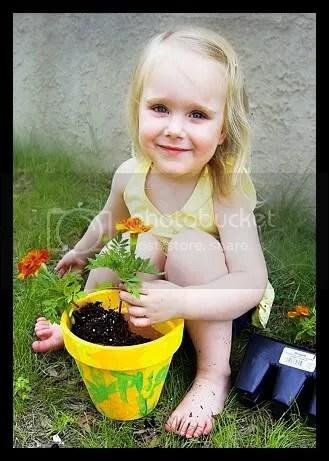 I LOOOVE the pic of Teagan sitting with her flower pot looking up. That’s gorgeous!!! Her expression is so incredibly sweet.